Here's a detail of a new image the Hubble Space Telescope released to celebrate its 100,000th orbit of Earth. 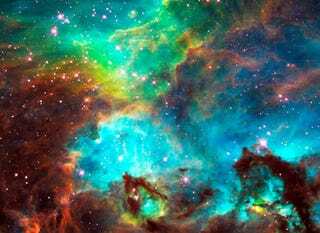 It shows the "firestorm" of star creation in the nebula near star cluster NGC 2074. The three-dimensional image shows off "dramadramatic ridges and valleys of dust, serpent-head 'pillars of creation,' and gaseous filaments glowing fiercely under torrential ultraviolet radiation," says NASA. The high-energy radiation from all those hot young stars is slowly eating away at the wall of the nebula. Click through to see the whole thing. And no, I don't know why part of the image is censored. Is it not work-safe? Is there something happening that NASA doesn't want us to know about?